Swedish Aspen This tree is an ‘Idaho Preferred’ Plant. Swedish Aspen is native to the forests of Sweden. 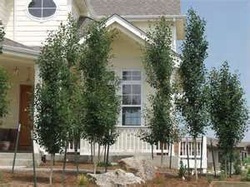 This slender columnar tree is great for smaller spaces, screens and along drives. It is probably the narrowest of the columnar trees. Swedish Aspen grows best in full sun to lite shade. The dark green leaves have a lighter silvery-green underside. It exhibits the same pleasant rustling sounds as the leaves of Quaking Aspen. Swedish Aspen will tolerate wet soils and it is also a Firewise plant.